During the early months of fall 1999, I was reading my letters from the AHS E-Mail Robin when I ran across yet another note from someone new to daylilies in which the writer asked what some term meant. It was a term easily defined, and several members of the Robin posted a variety of definitions, all different but all correct. But the question drew a response from this editor that was the genesis of The American Hemerocallis Society Daylily Dictionary. In response to the query from the Robin member and new fancier of the genus Hemerocallis, I wrote something like, “Ya know, somebidy oughta create a daylily dickshunery,” and the response was huge and instantaneous. “George, why don’t you do it?” And so this out-of-mind suggestion became a project that continues to unfold even as this Foreword is composed. There are many members of the AHS E-Mail Robin to whom a tremendous debt of gratitude is owed for their encouragement, criticism and contributions. At the top of this list must go Melanie Mason, who at the time was the soon-to-be AHS Publications Chairwoman. Melanie has honchoed this project from Day One with a firm hand but with kid gloves. Her suggestions have always been those of the nun who stands, smiling, with ruler in hand should I get out of line. Not once did she use the ruler, though I’m certain she had more than adequate opportunity and reason to do so. I shall forever be in her debt. The same must be said of Tim Fehr, the “fearless leader” of the AHS E-Mail Robin and AHS WebMaster. Tim’s ideas are evident on every single page, in every definition, in every photo. His enthusiasm was without bounds. “I can see linking terms within definitions to those terms elsewhere, and the terms to images or illustrations that help to define the terms,” was only one of his hundreds of brainstorms. He, too, shall forever be in my debt. We are especially indebted to Frances L. Gatlin, editor of “An Illustrated Guide to Daylilies,” to Binion Amerson of Dallas, Texas, for use of the terms and definitions found in the FAQ on the AHS Web site, to Gus Guzinski whose similar project confirmed some of our shaky terminology and particularly to Steve Webber for his most generous use of his now-out-of-print work, “A Daylily Encyclopedia.” Without the contributions of these four, this project would not have gotten beyond the title page. Our sincerest gratitude to you, one and all. Many others have lent their talents with camera, pen and ink, and scientific knowledge to this project. Susan Bergeron volunteered to gather information on critters that prove harmful to the daylily, and went so far as to gather the images of those critters from her comrades in the scientific community. Without Sue’s help, there would be a great void in this work. And Lee Pickles volunteered his article on how to grow proliferations. Thanks, Lee. Cheryl Postlewait graciously granted her permission for use of her illustration of a daylily that appears on the AHS banner, so those new to daylilydom could see what a daylily looks like, and how all of its various parts are labeled. Cheryl even went so far as to offer to do other illustrations should they be needed, and at some point in the not-too-distant future I feel certain her most generous offer will be accepted. We were literally inundated with photographs of individual blooms and parts of blooms to enhance the terms and definitions. Among those who gave of their photographic talents are Bobbie Brooks of Gloucester, Mass., Cheryl Harris of Hartsville, Tenn., and Michael Brown of Cacye, S.C.
Special thanks to Patrick Stamile for his text and photos for helping to define “edges” and to Bob Schwarz for his similar and enthusiatic contributions in the “unusual forms” sections. Certainly there are others who have contributed terms, definitions (some not precisely precise), illustrations and photos we have not mentioned here, and to each of you we extend our sincerest apologies, and our sincerest thanks. 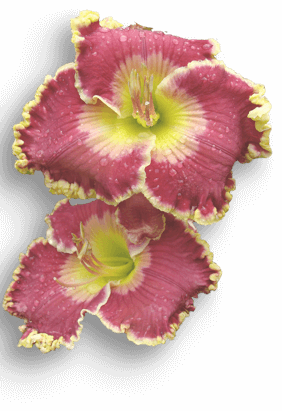 You have all done much to give this work to the world of the daylily fancier – indeed, to the gardener wherever he or she may be on this planet we all call home.